LinkedIn groups are basically online forums for people who use LinkedIn. They are a great way to learn from and network with people with whom you otherwise would not have any direct access. The first step in realizing the benefits of these groups is to join a few. 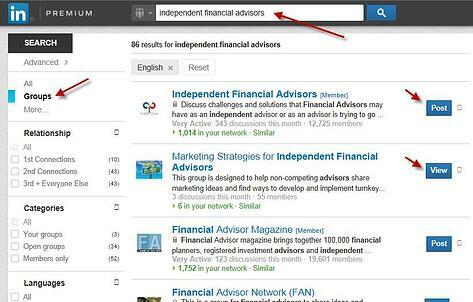 Type in your topic in the Search box at the top of your LinkedIn homepage. From the list that appears, narrow your search by clicking Groups on the left. If you elect to join a group, the group moderator will be notified. He or she will then take a look at your profile to determine whether or not you are a legitimate candidate who can add value to or benefit from the topics being discussed. If you pass the sniff test, you'll be approved as a member. Become familiar with how groups work. There is no need to participate; you can simply watch what's going on. Begin to see "experts" emerge. You'll come to see whose input and opinions you really like and respect and whose you don't. Then you can start thinking about how you could position yourself as an expert in a group you set up. Most likely pick up some nice tips related to the topic of the group. Once you're comfortable being a group member, the next logical step might be to create your own group of like-minded individuals. LinkedIn lets you do that as well. How Do You Create Your Own LinkedIn Group? Say you want to create a LinkedIn group for one of your niche markets. For instance, maybe you're an expert on the executive benefits compensation program at XYZ Company. You can set up a private group just for the execs there. 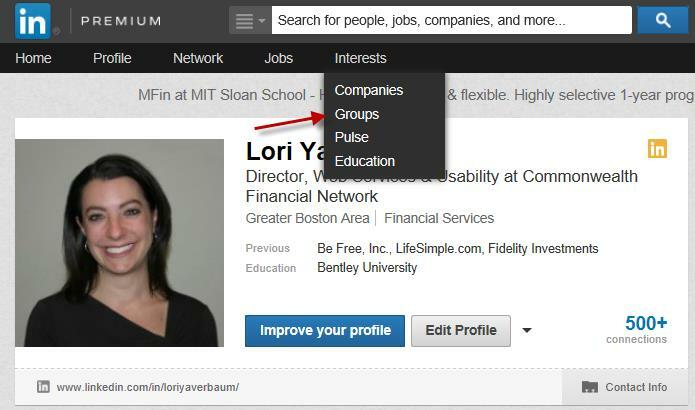 From your LinkedIn profile, go to Interests > Groups. Click the Create a group button at the right side of the screen. You will be asked a number of questions about the group you are creating, including whether or not members can join automatically or must request permission to join. Request to Join is selected by default and you'll want to keep it, as it will allow you to control membership. You should also check "Allow members to invite others to join this group" so that current members can help it grow. Another important step is to click Create a Members-Only Group, which is the last item at the bottom of the setup page. With an open group, anyone on LinkedIn can view and join discussions. Although this will increase your visibility to the general public, it also opens up the potential for your competitors to communicate directly with your group members, which you definitely don't want. With a members-only group, you're the one who decides who gets to join, so you can control, to a certain extent, the integrity of the group. This also gives you the opportunity to message a person directly, welcome him or her to the group, and introduce yourself. Now that you've set up a group, what's next? Invite your qualified clients to join the group and ask them to spread the word about it to their peers. Promote your group through your website, e-mail signature file, and communications you send to potential members. Each time you approve a new member, personally reach out to welcome him or her. Invite group members to contact you directly by phone or through your work e-mail with questions or concerns they might not be comfortable discussing with everyone. Actively monitor the group discussions and participate when appropriate to demonstrate your expertise. LinkedIn groups open up a world of opportunity for you to increase your visibility with existing and potential clients and centers of influence. What groups have you found particularly valuable to your business? Do you host your own groups? Share your thoughts below.